The four St. Mary’s University alums standing in front of beer vats in the Busted Sandal brew room. The small-batch craft beer movement is big business, and four St. Mary’s University alums are in the thick of it. 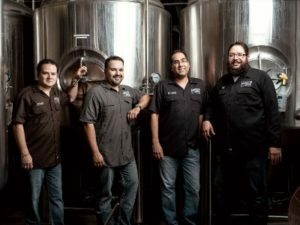 What started as a friendship among St. Mary’s classmates — and a shared love of brewing beer — has turned into Busted Sandal Brewing Company, which opened in San Antonio in 2013. “We got in at the right time,” said Roland Tamez (B.B.A. ’99), Busted Sandal’s marketing director. The partners are Tamez, Joseph Alvarado (B.B.A. ’01), Chris Rodriguez (B.S. ’01) and Jason Dennis (CL ’01), plus two additional partners, Michael DiCicco and Robert Garza. Each plays a part in the operation, sales, marketing or making of the beer. 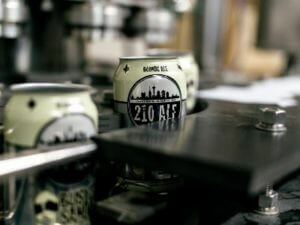 Cans of Busted Sandal’s 210 Ale on the production line. In the beginning, the friends used small-scale home brewing kits before moving out of the garage and into the local community, including The Pub at St. Mary’s, which often serves Busted Sandal. While they still have their day jobs, the brewery keeps them busy. After fewer than three years, they are tripling the size of their current tap room and have draft taps at more than 100 local establishments.